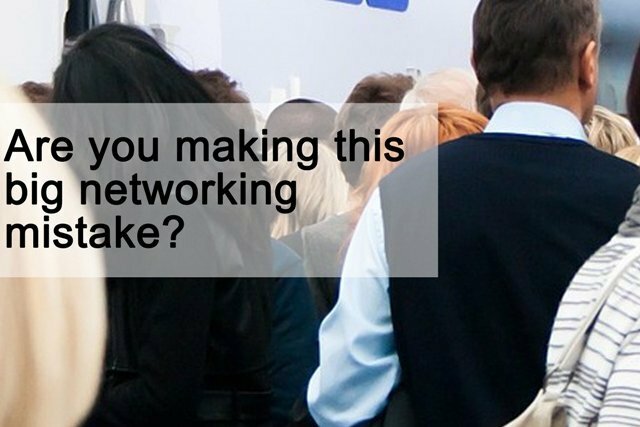 Are you making this big networking mistake? What does the word ‘networking’ mean for you? For me, it conjures up images of a small space crammed with people; some awkwardly making small talk, some deep into delivering their elevator pitch. There’s that annoying guy running around the room thrusting his business cards into the sweaty palms of politely uninterested attendees. Everyone wants to sell and be known. And then there’s me, in that uncomfortable moment of standing in the corner waiting for someone to talk to me – not you sweaty card man, I’m hoping for a meaningful conversation with someone who won’t try to sell to me. Yet, the mere idea of walking up to a group of strangers and starting a conversation fills me with dread. Even an afternoon at the dentist would be preferable! I hear from many people that they “don’t like networking” or they’re “terrible at networking”. It’s often a culmination of bad experiences and we imagine it’ll be the same next time too. In my recent article ‘how to master networking… even if you’re an introvert,’ I shared tips from Executive Headhunters, Andrew Ellis and Victoria Baker, for the benefit of both introvert and extroverted personalities. I believe the best piece of advice in this article is “Don’t assume others are confident” because we can be so good at comparing how we feel inside to how other people appear on the outside and we create stories about their experiences and assume they’re more confident than us. It’s nice to remember this is what we’re doing, and therefore, our thoughts about others are often incorrect. When you see that it’s really just about connecting person to person, it takes the pressure off to ‘work the room’ or deliver the perfect pitch. You give yourself space to be human; vulnerable and authentic. You connect with others at a deeper level. It’s easier for you to tune in to the needs of others; you’re more likely to notice that someone who’s feeling a little uncomfortable so you can help to make their experience a good one (plus, focusing on trying to make someone else feel more at ease is a great way to feel more confident in yourself too). So here’s what I suggest you do from now on: focus on what networking really is – a means to build individual relationships. That means ditching the dreaded n-word which you and I know has the potential to drum up all of those old associated experiences, affecting not only how you think and feel, but how you come across in your expressions, voice and body language too. Instead, think of it as simply “getting to know some people” which quickly takes the fear and anxiety out of connecting. And then, when you’ve made a connection, ask your new friend who they recommend you speak with next. One by one, you’ll soon find ‘your people’. I hope you find this advice as useful as I once found it. What are your best networking tips? Share them below.